How Do I Dispose of My Broken Fridge Freezer? Home > Ask Our Experts > How Do I Dispose of My Broken Fridge Freezer? Could you please advise me of how I can dispose of a irreparable fridge freezer as I do not have the funds to pay for the local authority to collect it. In fact, it’s very difficult to get someone to take away an old fridge freezer free of charge. 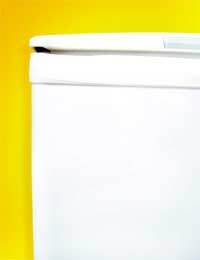 Charges for collecting a fridge freezer range from £5 to £30. Your first port of call for disposing of a fridge freezer should be your Local Authority to find out what their charges for fridge collection actually are and whether there is any help available for those that need to dispose of a fridge but can’t afford to pay the collection fee. They may be able to waive the fee in certain circumstances so it’s worth asking about this. Your Local Authority will also be able to advise you on how and where you can dispose of the fridge yourself. If you can transport the fridge freezer yourself (or get someone to help you) to a designated hazardous waste recycling site then you shouldn’t have to pay for this. It’s important that you do find out which specific sites you can use as not all waste recycling sites are suitable for fridge freezers. You may need some proof of identification to prove the fridge was for personal, rather than business use. Additionally it’s possible that a local furniture recycling or waste removal company in your area will collect the fridge for a lower price than the one that your Local Authority charges. Many of these companies refurbish or use parts from old furniture and white goods so that they can provide household goods free or at low-cost to people in need. With this in mind, if you have financial difficulties and can’t afford to pay a fridge freezer collection fee, these companies may consider waiving or reducing the fee. If you are buying a new fridge freezer and having it delivered to your home, the retailer may agree to dispose of your old fridge freezer for you. Again, many companies do charge for this though. Disposing of a fridge freezer can seem confusing and more trouble than it once was. The reason is that the disposal of fridge freezers is now tightly regulated because of the fact that some components of fridges can be extremely harmful to the environment. Since January 2002, all ozone-depleting substances (ODS) must be removed from a fridge before it can be recycled or thrown away. Anyone found not disposing of a fridge freezer properly – and this includes fly tipping – is eligible for prosecution and a fine of up to £2,500. Can Used Cooking Oil be Put into Garden Compost? We hope the above article gives you the information on who you should contact for help. My neighbour dumped an oldfridge/freezer in his front gardenover 12 months ago. I have asked him to have it removed but he refuses. As the freezer deteriorates surely there is a danger to the environment. What can be done about this danger. Try a local charitable organisation or a handy man instead?